Tarcisio Barreto Ceballos shares his career between his work as solo violinist and conductor, a regular guest artist in Europe and North and South America, in countries including Spain, Italy, Germany, Norway, France, Venezuela, Colombia, Brazil, Argentina, Chile, Costa Rica, the USA and Uruguay. For the past 15 years he has been the musical director of the Orquesta Sinfónica de Lara, where he played first violin and was concertmaster for 11 years. This orchestra, founded in 1976, is considered to be one of the finest symphonic orchestras in Latin America. 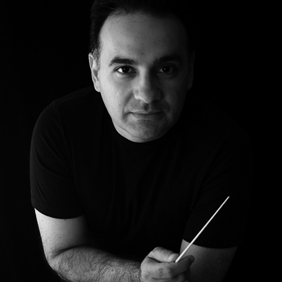 Ceballos is regularly invited to conduct the Orquesta Sinfónica Simón Bolívar, whose musical director is Gustavo Dudamel, the Orchestre Philharmonique de Marseille, and others. He was trained as a conductor and violinist in the El Sistema youth orchestras of Venezuela, and undertook further training in Spain, Italy, Switzerland, Germany, France, Norway and the USA. In 1994, he was appointed musical director of the Occidente Opera Company, with whom he has staged many operas. In 1997, he was named Cultural Executive of the Year in recognition of his work in promoting cultural development in Lara State, Venezuela. Ceballos also directs the support programme for Youth Orchestras of America funded by UNESCO and the Andean Development Corporation. Since 1996 he has been executive director of the Vicente Emilio Sojo Conservatory in Barquisimeto, where he teaches intensively.